It began in the first part of December 2004 with a front page story about our rescue in the local paper. 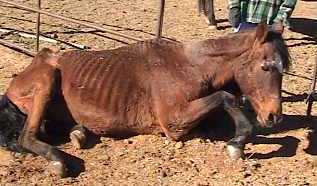 That led to a phone call from a man saying he knew where there were 8 starving horses in Flora Vista. Sure enough, he was right. Four Morgan stallions are literally walking skeletons, and one of them has hooves so bad that he can�t stand more than 5 minutes. Two Morgan mares and an Arab gelding are in somewhat better shape. This is due to having been in pasture from August through part of December, but the pasture owner evicted them for lack of payment. 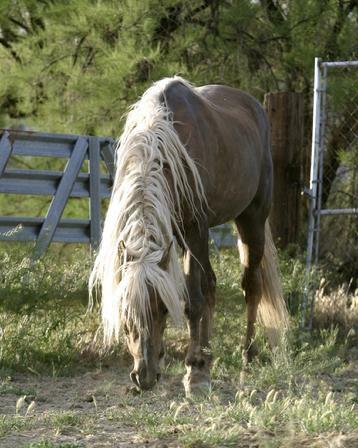 These seven horses are at the owner�s house, and there is one bale of hay on the property. 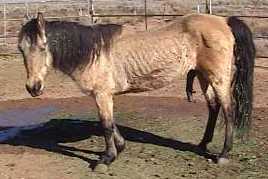 The owner asks FCER to help her get her remaining Morgan mare from the pasture. She is unable to do so because she has no money for gas, she explains. 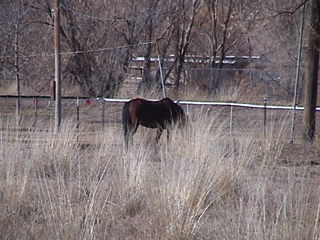 Attempts by a representative for FCER to convince the owner to surrender the horses to the rescue are futile. They only need a little food she says, and we are just after her stallions (the youngest was 19 at the time). Contact was made with the Livestock Inspector for a possible confiscation. 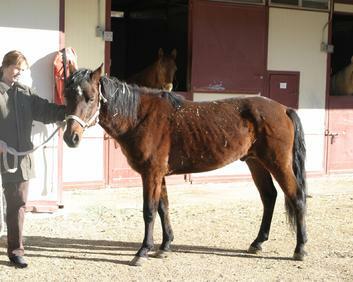 The night before the inspector was scheduled to arrive, FCER (Four Corners Equine Rescue) gets another phone call saying that the horses are all gone. Sure enough, he�s right again. Then an amazing thing happens. The phone rings again. This time it�s the owners neighbor. She explains that she has arranged a deal between her (ex?) stepdaughter and the owner, and the horses are on their way to Grants. 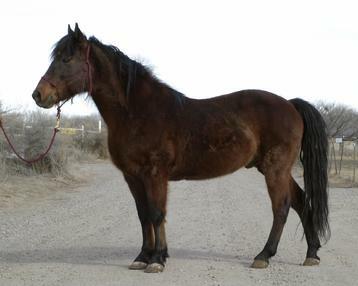 The only horse that didn�t get transported is the mare Gypsy, who was still uncatchable in the pasture. She explains that the horses are going to a good place, and gives Debbie the name and phone number of the woman in Grants. Late Friday we get word that we can go pick up the surviving horses. The Livestock Inspector had gotten a vet to come out to euthanize El Don. There are now 4 horses, as we are told that Kathy owns the Arab gelding. Gypsy is still in the pasture in Aztec, (being watered by FCER, as there is no available water) so the Inspector will have to go to Aztec Court for a seizure warrant. First thing Saturday morning Robin Kelly and Debbie Coburn set off to Grants. 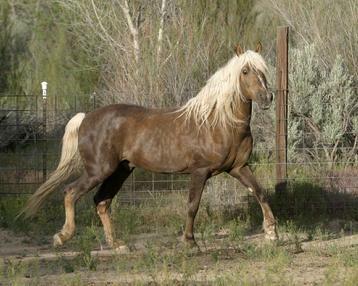 Upon arrival we determine that Magic, the palomino stallion, is by far the worst off. So bad off, that we discuss taking him to Grants or Albuquerque instead of returning to Farmington. We decide to proceed to Farmington, and have already alerted Dr. Quintana at Animal Haven Clinic, that we will be infringing on his much deserved Saturday afternoon off. After a very slow trip back, all horses arrive safely at the clinic. The initial exam shows 3 of the 4 to have a body score of 1, and one mare is a 2 on the Hennecke Body Scoring Chart. Now the long, slow road to recovery will begin. Magic�s fate is questionable. It will be many months before any of these horses actually resemble a horse again. 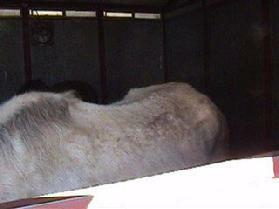 All are grossly underweight, their teeth in terrible shape, their hooves just as bad. The farrier - Steve Mathews - is called in to start corrective trimming. It has now been 8 long days since the first call came in to FCER. 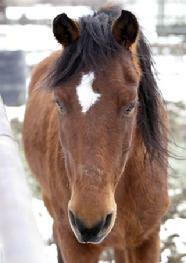 On December 24th the owner of the horses, Sondra Beck, is arrested on 2 counts of animal cruelty. She is being held on $10,000 cash only bond. It somehow seems right that she spend Christmas in jail, hopefully eating bologna. Two of the mares, Fanny (32 and the matriarch of the herd) and Bridget (25 and Fanny�s daughter) are released by the vet. The Cumberworth family has offered to foster them. They are to be the personal project of Tammy Cumberworth, and what a wonderful job she does. General is also released, and comes to the main FCER facility. Magic remains at Animal Haven. Meanwhile, we continue to care for Gypsy in the pasture. When we first met her, she wouldn't let people come within 40 feet of her. Daily feedings and water have made us her friend. Finally we get to touch her! Three days later she whinnies when she hears the truck! The lovely sounds of success. We are proud parents the day she comes across the pasture to meet us! In Febuary we finally receive word from Randy that we can pick her up. The mare that couldn't be caught, and couldn't be loaded, was in the trailer within 15 minutes. No ropes, no whips, just 3 people trying our best. Off to the vet's she goes. On December 31st FCER receives a call from Dr. Quintana at Animal Haven. He has decided to take on Magic as his own personal project. He tells us that Magic's treatment will be expensive, and although he doesn't like to fall in love with his meal ticket, sometimes a horse comes along that's just special. Magic is such a horse. What a way to ring in the New Year! 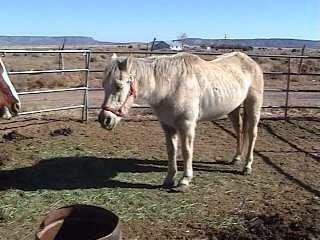 February 9th the Cibola Magistrate Court took ownership of the 4 surviving horses away from Sondra Beck. FCER now has to go through to lengthy legal process to obtain ownership, which we do. The horses all continue to improve - when Fannie and Bridget were weighed at a vet check on the 4th, Bridget had gained 140 lbs, and Fannie 100. On February 15th Sondra Beck had a pretrial hearing in Magistrate Court in Aztec. We really hoped to see some glimmer of realization of what she had done, some acceptance of responsibility. None. She was just as defiant, just as in denial as she was the first day we ever laid eyes on her. She told her attorney, in open court, that the livestock Inspector could kiss her a**, she had done nothing wrong, except love her horses, and she didn't care if she had to stay in jail a year, she is not guilty and wants her horses back. Bail was reduced to $10,000 bond. Her case is bound over for trial. Finally, on March 30th, 2005, FCER receives paperwork from Randy Nelson, our Livestock Inspector, transferring ownership of the 4 Morgans we picked up in Grants to FCER. Gypsy is far behind the rest in the legal system, and it will be more months before FCER gains ownership for her. The long grind continues in the trenches. Tammy Cumberworth has been there every day cleaning pens, feeding, brushing, water, and regaining the trust of starved horses. The staff at Animal Haven works with Magic, who has finally turned the corner, and will survive. Robin continues to be there in whatever crisis, drops everything to come help when General sent Debbie to the Emergency Room. Cari, our neighbor, has been watching progress and monitoring horses every day. Robins Mom, who takes care of Robin's horses, while Robin takes care of FCER. Steve, the farrier, who gives us breaks on the cost of corrective trimming. Doc Shrum and Shirlee, who bring us feed. Ron and Mary, we strive daily to make this rescue work. Don Kennedy and his wife who have donated much needed hay. Cristy Cumberworth and her entire family for supporting Tammy in her efforts and generously offering stall space. Beeler and Sheila that come and help feed and brush and re-socialize the horses. And all the generous people that have donated funds to help. John Templeton and his wife, that own the pasture for helping water Gypsy. Robin continues to be there in whatever crisis, drops everything to come help when General sent Debbie to the Emergency Room. Cari, our neighbor, has been watching progress and monitoring horses every day. Robins Mom, who takes care of Robin's horses, while Robin takes care of FCER. Steve, the farrier, who gives us breaks on the cost of corrective trimming. Doc Shrum and Shirlee, who bring us feed. Ron and Mary, we strive daily to make this rescue work. Don Kennedy and his wife who have donated much needed hay. Cristy Cumberworth and her entire family for supporting Tammy in her efforts and generously offering stall space. Beeler and Sheila that come and help feed and brush and re-socialize the horses. And all the generous people that have donated funds to help. John Templeton and his wife, that own the pasture for helping water Gypsy. On the 8th of April, 2005 Magic and Fannie were adopted by Sue Zellhoefer. Sue had been visiting Magic at the clinic for quite some time. 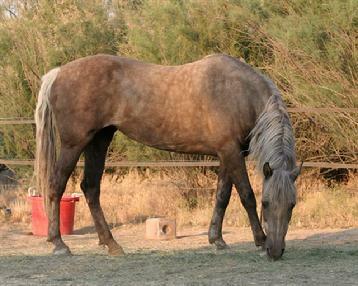 She has taken on the responsibility of 2 horses that were horribly neglected. Her commitment to these 2 horses is astounding. She is willing to take care of their needs for the rest of their lives. UPDATE - as of the writing of this article, Sondra Beck is still in the San Juan County Detention Center. She has a hearing in May. Gypsy still has not been ordered for Involuntary Sale. Magic and Fannie have been adopted. 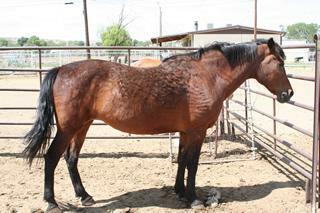 General, now a gelding, and Bridget are available for adoption. Chon Abel and El Don are dead. UPDATE - In March, 2005, Sondra Beck pleaded no contest to one count of animal cruelty. She was sentence to time served - 5 months, and 7 months of probation. Our appreciation and sympathy go out to Sue, and everyone that helped Fanny during her final chapter. After a complaint is received by a Livestock Inspector, that Inspector MUST follow up on the complaint. If it is determined that the animals should be removed from the owner, the Inspector goes to the Judge and asks for a Seizure Warrant. If that is granted, the animals go to ?, hopefully a rescue will come forward to help. Then an Order for Involuntary Sale is issued, if a judge so orders. When the sale is complete, the Inspector returns to the court for a Final Disposition. Any charges filed against the owner of the livestock is a separate case. 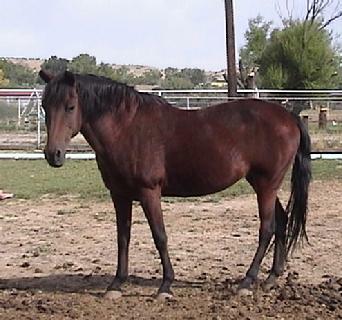 Four Corners Equine Rescue is located in Flora Vista, NM. Organized in 2004 as a non-profit, and is an all volunteer organization. FCER has it's 501(c)3 IRS ruling. We rely totally on donations and fundraisers. We can be reached at: FCER 22 CR 3334 Aztec, NM 87410. PH: 505-334-7220.